After going 2-0 up through a trademark Robben goal, momentum shifted in Turin as Juventus pulled back two goals to get a draw in the Champions League first leg clash. For the first 60 minutes Bayern exercised great control through strong play in possession and an effective man-oriented press yet as the rhythm changed and Juve improved, they displayed less stability both with and without the ball. Allegri opted to organise his side in a 4-4-2 formation which situationally would become a 4-4-1-1 or a 4-4-2-0 when defending their own half. It seemed the manager looked to rely on his defence to earn a 0-0 or potentially sneak a 1-0 win at home to the German champions as they played with emphasis on defence. Acting in a more passive defensive block, Juventus used a zonal marking scheme with smaller man-orientations than when I’ve seen previously, most likely aiming to exert better control and be less manipulated by Bayern’s movements. The two forwards generally looked to cover any passes into the midfield whilst Pogba and Cuadrado were quite variable in their position due to their marking role. It was more common to see Cuadrado defending in wider areas however due to the orientation of Bernat, whilst Lahm acted as more of a midfielder. That being said, Juventus did press in some cases but only intermittently as they most often sat in a deeper block. When they did press too, they were not totally effective either, as Bayern worked well to bypass the pressure of Mandzukic and Dybala. In possession there were some signs of asymmetry from Juventus. On the left, Pogba would move inside and support central attacks as he looked to aid playmaking whilst Evra moved higher up the pitch. Whereas on the other flank, Cuadrado acted as a more orthodox winger with Lichtsteiner behind him. Meanwhile, Marchisio dropped close to the centre-backs as usual whilst Khedira was more of an 8. In the attack, both strikers stayed relatively high apart from scenes where Dybala had the potential to drop deeper. Bayern’s line-up suggested a possible 4-3-3, however as soon as the match began it was clear that this was not the case. From the 6 position, Arturo Vidal dropped between the centre-back pairing and a back three was created when in possession. In the 8 position we saw some asymmetry as Thiago acted deeper to support the ball circulation whilst Thomas Müller acted much higher alongside Lewandowski as a 4th forward in the front line. On the wings, Douglas Costa found many isolation situations on the left flank whilst Robben played an important role on the right. The most interesting aspect of their structure however was in the full-backs. Both Bernat and Lahm were oriented inside and acted in their respective half-spaces, supporting the possession through connections and offering themselves in horizontal circulation of the ball. The pair helped to create triangles across the pitch as the strategical position of the half-space proved beneficial. Adjacent to the centre of the pitch and a wing, the full-backs could support possession in most areas from the half-space and the aid Bayern’s attacks across the width of the pitch. However the two full-backs showed slight differences in orientation however which caused some asymmetry in the structure. In the left half-space, Bernat acted higher than Lahm and made movements against the defensive line usually, whilst in some cases he could move wider to free Costa. On the other hand, Lahm acted deeper and more like an orthodox 6, supporting possession through the right half-space in front of the Juventus midfield. The difference in orientations were relevant to the supporting roles the two possessed. On the left side, Bernat constantly looked to open the 8 space for Thiago through his movements forward, which were often accompanied by the falling back of the ex-Barcelona midfielder. In contrast, Lahm’s deeper support in the right half-space aided the connections better whilst he had the task of integrating Robben on the wing, which was often done through small overloads and by obtaining the defensive attention of Pogba. The Bavarian build-up was particularly strong through the dropping movements of Vidal. They were consistently able to break the press of Dybala and Manduzkic through a small overload, allowing one of the wider players in the three-chain to progress past Juventus’ pressure. 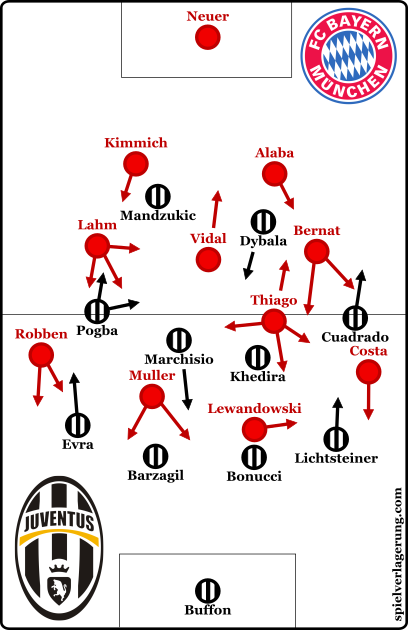 In a number of scenes in Juventus’ half Vidal became the deepest Bayern player as both Alaba and Kimmich moved further forward to create an inverted triangle amongst the back three. This small adaption had some interesting effects as the two higher defenders were theoretically in better positions to penetrate Juventus’ midfield whilst they could also situationally support the wider attacks. Although they improved almost immediately following the interval, Juventus were particularly better after Robben extended Bayern’s lead. The rhythm of the game shifted and Juventus were progressively taking a hold of the match now on the front foot after an extended period of Bayern control. Despite Bayern exerting a high degree of control throughout the majority of the first 60 minutes, the momentum of the game shifted almost entirely and the Bavarian stability was now absent as the game became more chaotic. Juventus’ pressing became more active and with an increased aggression as Mandzukic and Dybala looked to pressure the ball much more frequently and with greater intensity. The midfield of the home side had more clear man-orientations which gave them the access which they often lacked in the first 45 minutes, as Hernanes and Khedira moved higher to apply pressure to the Bayern midfield. In doing so they disrupted the Bavarian building game and Guardiola’s side were less able to cleanly progress the ball and they were unable to move it with the same levels of control. In build-up the home side were also improved, as they benefited from a better central access which worked well against Bayern’s press. From the first chain they were able to quickly progress the ball through the lines and Lahm in particular was less able to develop access in the half-space. The improved circulation of the ball, as well as the slightly adapted structure was more effective against the man-oriented Bayern defence. In terms of quality this was the match of the CL round and it did not disappoint as we saw an interesting battle between two tactically and technically strong teams. Bayern’s dominance throughout the first half ultimately counted for little after Juventus came back as the rhythm of the match shifted significantly following Robben’s finish. Allegri’s side came back into the game with an improved press higher up the pitch whilst they became better at bypassing the Bayern press as the away side lost their stability with and without the ball. Thanks for the insightful summary. Do you think Juventus will adopt a similar approach in Munich? As in, sitting deeper, then pressing higher up the pitch in the second half. Obviously, Juventus played better in the second half, but I wonder if they will have the legs to press Bayern for 90 minutes and possibly more.